Mrs. Yollis' Classroom Blog: Mardi Gras: Learning From Experts! 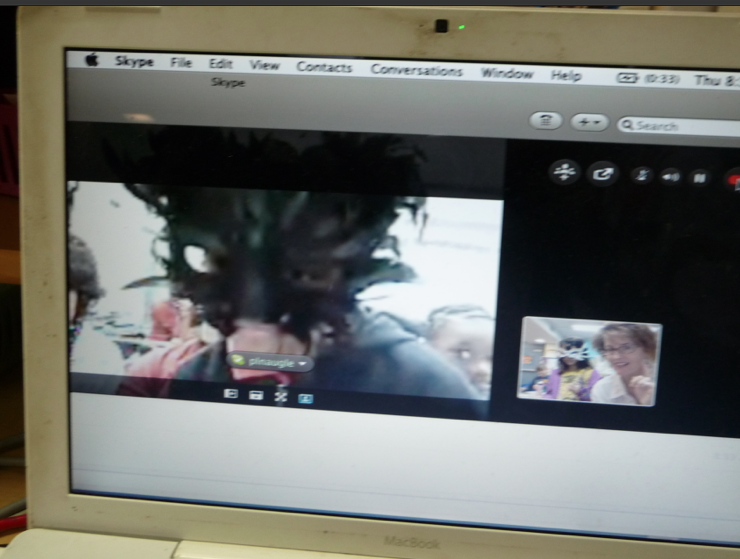 Mardi Gras: Learning From Experts! 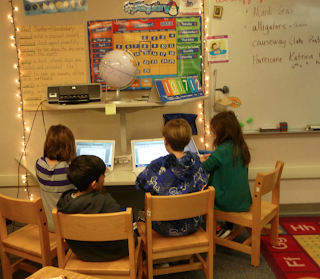 Mrs. Yollis' class had the opportunity to learn from experts today! They Skyped with Ms. Naugle's 4th grade class in New Orleans, Louisiana. 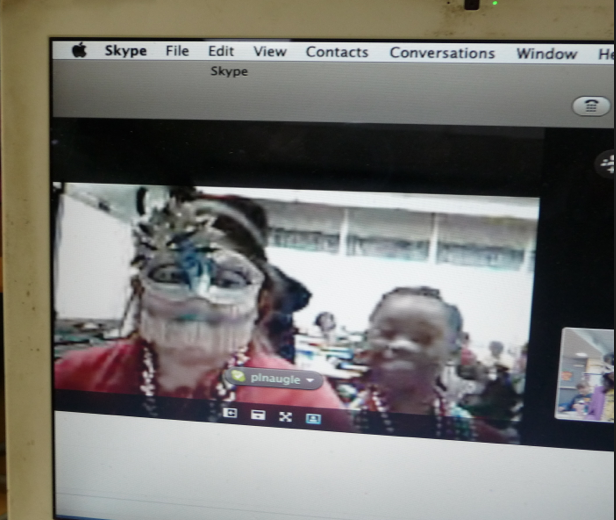 The Louisianans taught the class all about Mardi Gras! Over a million people descend upon New Orleans to be part of this celebration. Alexandra and Ellie located the Pelican State in Big Blue, our class atlas. Notice that Leila brought in a Mardi Gras mask and Aidan brought in some cajun spices for the class to smell. Many students have had cajun spices on chicken and pasta. Royce, Mia, Trey, and Sasha took notes in Word. 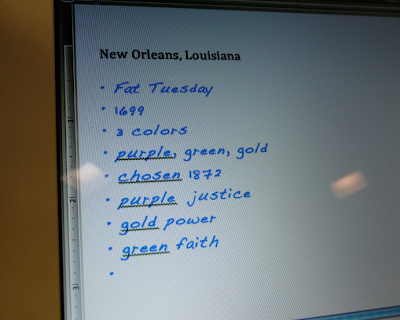 Many students took notes on paper, and below is a photo of Kelly's! We used the notes to write the following paragraph! Mardi Gras came to America in 1699, and it is also called Fat Tuesday. 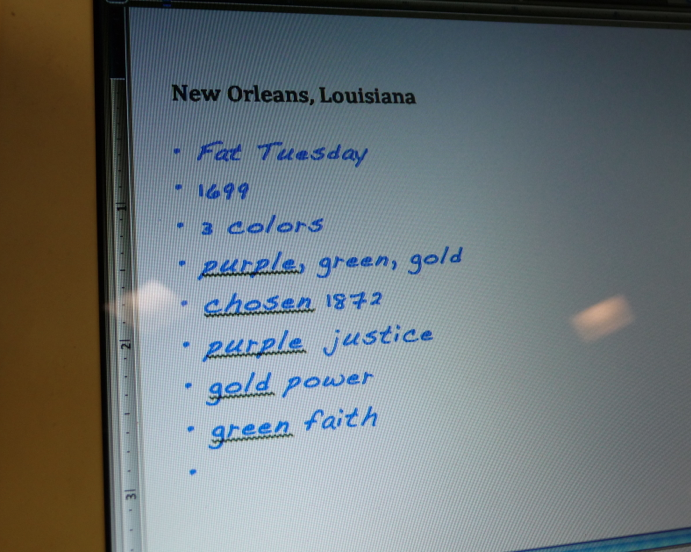 There are three main colors for Mardi Gras, purple, green, and gold. Purple symbolizes justice, green symbolizes faith, and gold represents power. There are many parades during Mardi Gras. The parade workers are called krewe, and they help build the floats. There are many parades. In fact, there is one ever day during the week, and on weekends there can be two or three scheduled! Many of Ms. Naugle's student attend the Rascal's Parade which is only for children. Mardi Gras starts Tuesday, February 21 this year. Here are some of the the Mardi Gras souvenirs! This student caught a football and a leather sword at one of the parades. At the Zulu parade, they give out coconuts! They do not throw the coconuts because that would cause a lot of injuries! Ms. Naugle is hoping to get a coconut this year! Many parade goers wear fantastic masks! Here are two great examples! At the end of the presentation, they performed a dance for us! Music is a big part of Louisiana's heritage! We loved the music and the dancing! 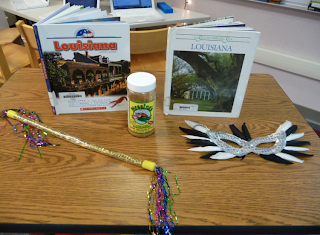 We also used library books to learn more about Louisiana. Louisiana is the 18th state, and its capital is Baton Rouge. The Pelican State is home to many alligators. Some of Ms. Naugle's students have hunted alligators when it is alligator hunting season. 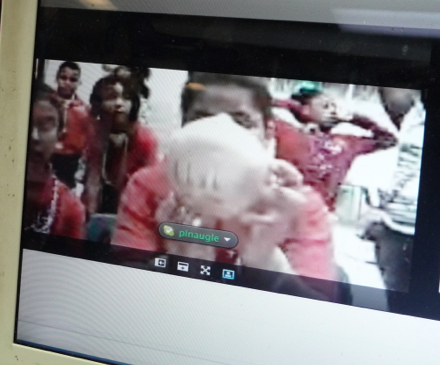 We talked about Hurricane Katrina that hit New Orleans in 2005. It was a deadly hurricane. The name Katrina can no longer be used in naming a hurricane. We were sadden to learn that many of Ms. Naugle's students had to evacuate. Some were out of their homes for over two years! Maya did a wonderful job with the photographs! Thank you, Ms. Naugle and class, for sharing this celebration with us. We loved learning about Mardi Gras from our new expert friends! 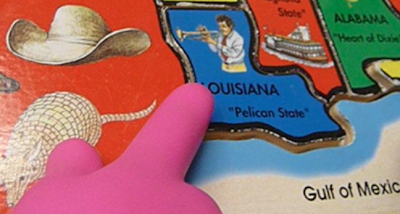 Do you remember any other facts about Louisiana? Have you ever been to a celebration like this? Wow. Your students are such great learners. 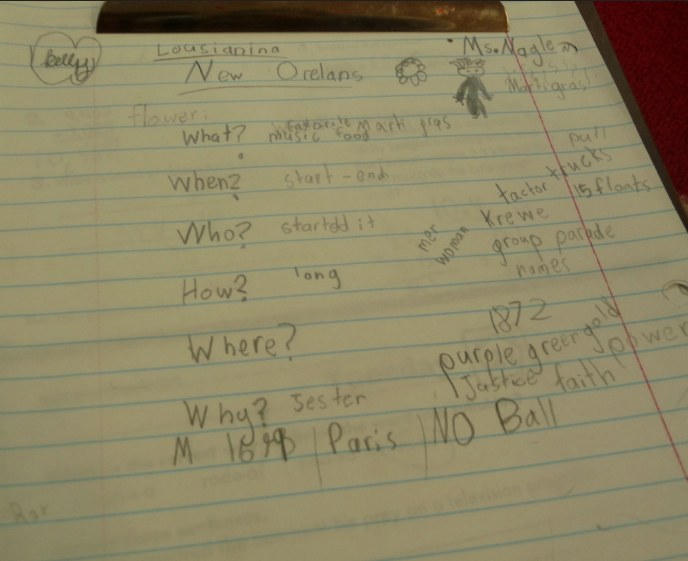 They really listened and got the most important facts we shared about Mardi Gras. It was absolutely awesome to be a part of your learning today. I can't wait for my students to read this blog post tomorrow. Now, who is ready to come to Mardi Gras and yell, "Hey, throw me somethin' Mister!"? 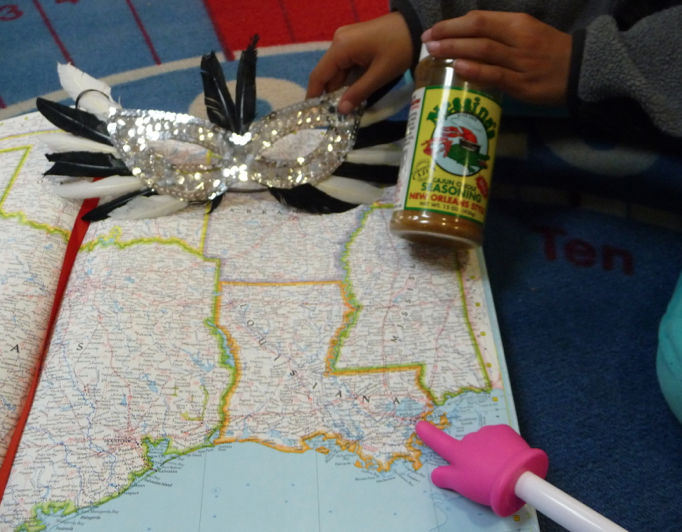 We really enjoyed learning about Mardi Gras! Your dance was extraordinary! 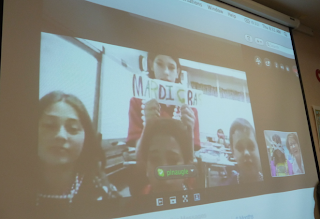 Our favorite part about the Skype call was probably the part when you shared about the prizes that you and your class got from Mardi Gras! We do want to go to Mardi Gras! We think that it would be a lot of fun! 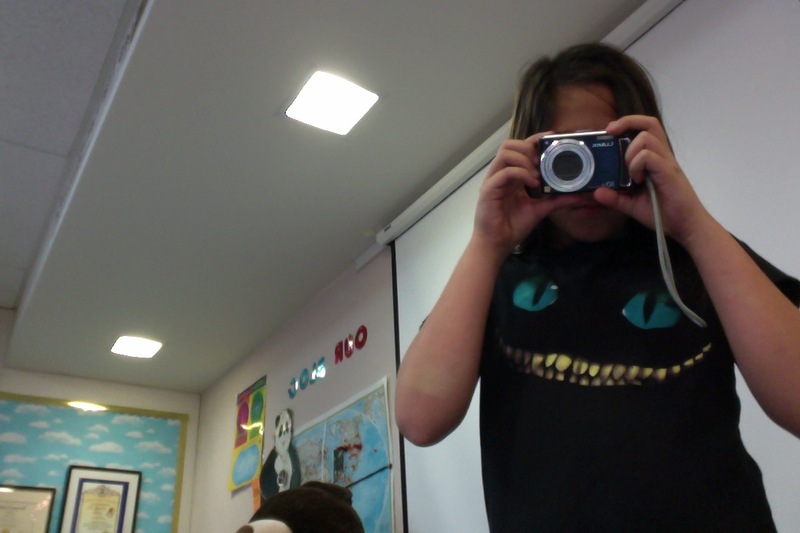 Awesome job on the pictures! I really enjoyed looking at them! I have been to New Orleans, Louisiana twice. Unfortunately, Mardi Gras was not going on when I was there. I would have loved to experience that. I saw alot of pretty houses during my trip. I also noticed something really interesting... there are beautiful cemetaries and they are above the ground. Do you know why that is? I really enjoyed learning all about Mardi Gras. 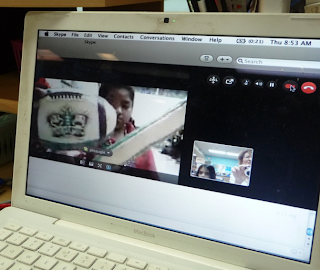 What made it even more interesting was the fact that you were able to skype with Ms Naugle and her class. I would love to go to a Mardi Gras celebration and how beautiful where those masks. I also enjoyed watching Ms Naugle class dancing to the rhythm of the music. Here in Australia we have a celebration similar to the Mardi Gras and it is called Moomba. The Moomba festival is celebrated every March from the 9th to the 12th. At Moomba there is a parade of floats and performers dressing in colourful costumes. As well music and then on the last day of Moomba it ends with a huge display fireworks. Thank you for sharing this great celebration. Great post! Sounds like an exciting day in the classroom! I see by the comment above, someone has talked about The Moomba Festival. That certainly means part time for Melbourne. What I didn't know was some of the interesting facts you gathered in your post. I think Louisiana would be great fun at Mardi Gras time. Wouldn't it be fun to have a mini mardi gras theme for a school or class party. The one thing I would not want to do is be in the parade. I find the costumes quite itchy! Do you want to be in the parade? Great information about Mardi Gras! I was interested in learning about the meaning of each color. I have only been to Louisiana once and enjoyed my visit. 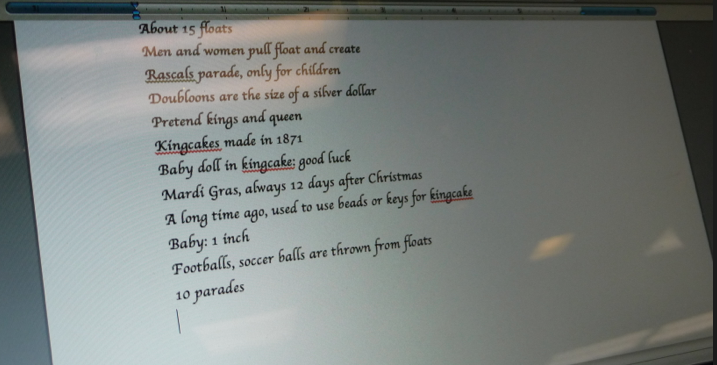 Did you learn about King cake and the baby? We have a family friend who celebrates Fat Tuesday by making Jambalaya and King Cake, it's delicious. I really like you fantastic quality comment! I have never been to Louisiana, but I hope to go there soon. I also was very interested in the colors! Who ever knew that colors could mean something? 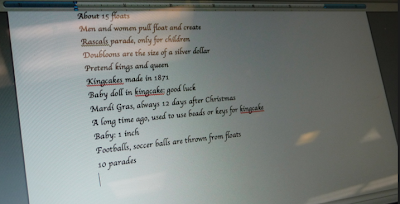 About the baby in the King Cake. If you find the baby you have good luck. The baby kind of reminds me of an umbrella, if you open a umbrella in a building, you won't get married! Fire Safety With Ellie's Dad! Video Tutorials: What Are Quadrilaterals? Circle: Radius and Diameter Exploration!